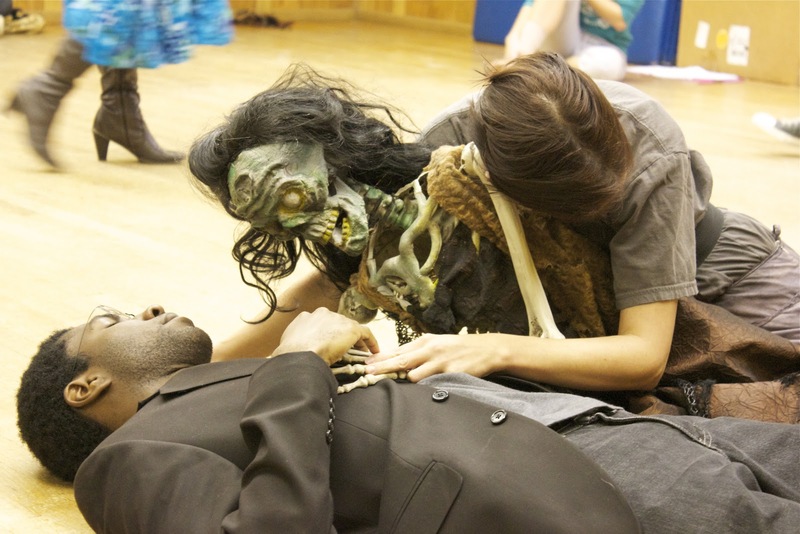 ORLANDO — Creepy creativity is the ticket during the run of the live theatrical “Phantasmagoria III: Something TRULY Wicked This Way Comes” at the Lowndes Shakespeare Center in Loch Haven Park. This unique blend of dark emotion, comedy, poetry, dance, puppetry and much more will be presented like never before, because for the first time this “Victorian steampunk circus” will be performed in the round or arena style with the audience surrounding the action. “The idea of loss, the idea that our stories can impact,” said director John DiDonna when asked about some of the major differences in this year’s production. Story-telling characters seen in the past installments are growing more complex in addition to newcomers set to add a rich level of diversity. Woven into this production will be seven stories from early 1900s literature such as Edgar Allen Poe’s “The Tell Tale Heart” and Sir Walter Scott’s “The Wild Huntsman.” These centuries old fables will be performed with style and precision by actors in a classically theatrical style. And then there are the puppets created to match the overall tone of the production by helping bring climatic scenes to life. When it’s dark they’re very dark, when it’s funny they’re very funny. 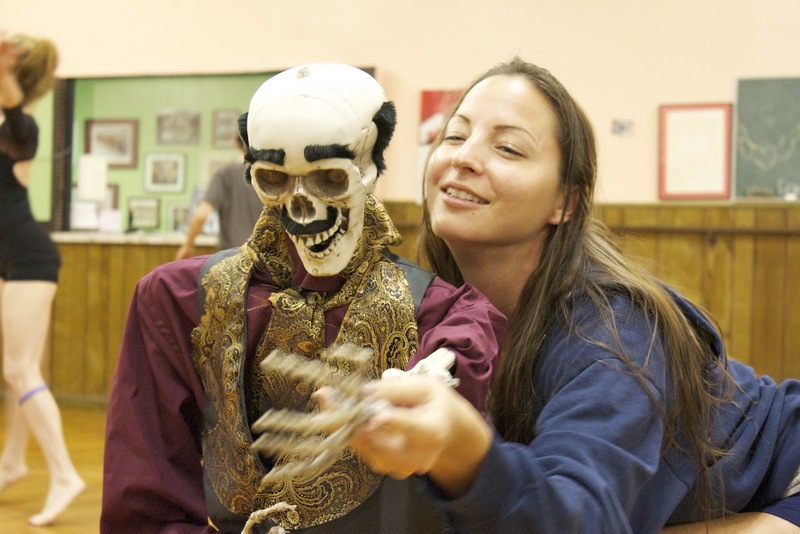 “Maybe Halloween isn’t quite your thing or you don’t usually go see horror stories, there’s a lot of traditional ballet and things in there for everybody,” said actress Samantha O’Hare. Over 40 actors and crewmembers involved with this year’s production are hard at work going over the fine details and refining the final version of this complex show. In addition they’ve recently had members participate in preview events; one at a local nightclub “The Abbey” and another in front of City Hall in downtown Orlando, as part of the Creative City Project. “It’s just a huge crew of incredible people who can do a million different things,” said actress Cameron Gagne. Countless hours have been spent designing costumes and building puppets, and the script writing took DiDonna over six months to compile and construct. This production has been a work-in-progress since the end of “Phantasmagoria II” last October. The runtime for each show is around 90 minutes and there are only 13 scheduled productions. All are evening performances starting at 8:30 p.m., with box offices sales starting at 7:50 p.m. and doors opening at 8:10 p.m.
Tickets are $15 - $20 at the door and can be reserved by calling 407-328-9005. Credit card orders can also be made in advance online at www.redchairproject.com. More information about this show and other updates can be found on the groups Facebook page at www.facebook.com/PhantasmagoriaOrlando. 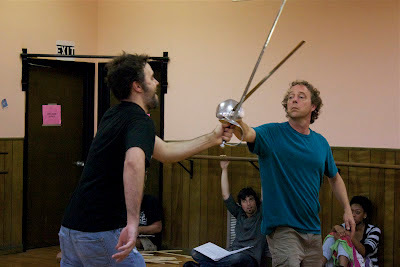 Sword fight between Josh Geoghagan (left) and Chris Prueitt (right). Amy Tattersall and her spooky companion work through rehearsal.